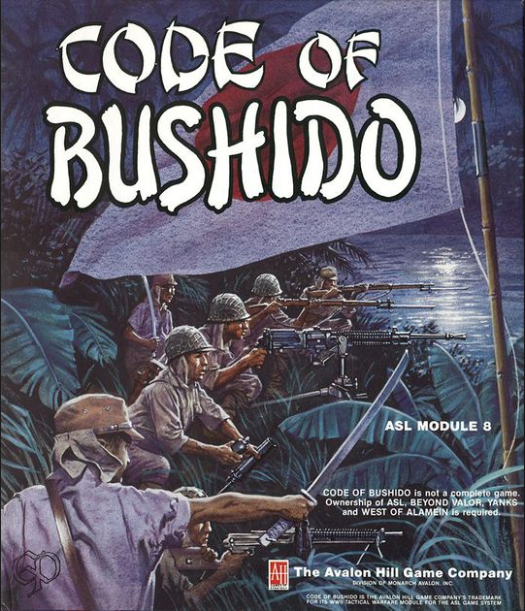 CODE OF BUSHIDO, the Japanese ASL module. Eagerly anticipated for years, the Japanese finally make their debut in wargaming's premier system of WWII tactical ground combat. Inside you will find the complete ASL order of battle for the Japanese: all the significant vehicles, guns and troop types they employed from the 1930s through 1945. Eight scenarios, whose settings range from the barren plains of Manchuria to the steaming jungles of New Guinea, pit the Japanese against a wide variety of Allied nationalities. Also included are four new mapboards (#s 34-37), fully compatible with the other SL/ASL boards, which depict the dense vegetation so common in tropical areas. Four sheets of overlays (village, stream, wooded hill, rice paddies, etc.) provide the means to create an almost endless variety of new terrain configurations. Chapter G of the ASL rules covers the many unique characteristics of the Japanese as well as new terrain types like jungle, bamboo, huts, swamp and kunai grass, among others. Fanatical soldiers who will die rather than break and run - unwavering, seemingly unstoppable banzai charges - individual tank-hunter infantrymen willing to blow themselves up along with an enemy AFV - these are but a hint of what is offered in this most unique addition to the ASL system. Your first CODE OF BUSHIDO scenario will be an ASL experience like none before - and one you'll likely never forget.